Hey everyone. Just wanted to do a super quick post. I just got an e-mail from wowsocool.com informing me that KonadUSA (the distributor) has asked them to stop all their coupon codes since they have gotten complaints from other retailers. Jessica, my contact, said she would give it a day or so to make any adjustments so if you wanted to order some Konad plates or polishes at 30% off, here is your last chance. My code (and all others) expires 3/5/10. Use code frmheadtotoe for an extra 30% off your order. This includes everything except for their "Build Your Own Kit" set which is already very discounted. Orders over $20 have free shipping within the US and Canada and they do ship internationally also. I'll actually be ordering some more plates myself. Look at how freakin cute this new one is! I love the bear at 45 degrees to the right. Is he sqatting? Laying down? I don't even know but he looks hilarious. I also picked up the Sponge Nail Art kit since it looks interesting and an easy way to do gradient nails. I also grabbed the 2-sided Konad stamper since I think it will be easier to see darker stamps on the green side versus the red of the original small Konad stamper. Click here for old nail posts for inspiration! Thanks for informing us, the code WAS a very generous offer, but protests from other retailers? I think those other retailers just needed to find something to attract customers. >___> So petty of them to "whine to the teacher", so said. Aww bunny plate!! I've never seen that one before! I didn't know they had plastic scrapers! That's the best idea ever, I hate hoe my plates always get scratched up. 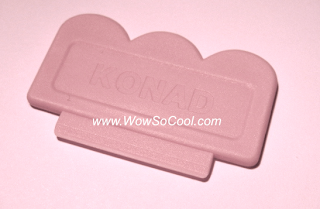 omg, that konad plate is so cute!! I want it..
aww those animals are so cute! Thanks for letting us know about this Jen! I just made an order and ordered a few more plates. After the discount it fell short of $20 though, and I didn't notice so I ended up paying shipping! oh well :T Do you think it's necessary to order some of those special polishes? I will have to try out the plastic scrapper. I was so sad that the metal one scratched up my first Konda plate. =( I got my first kit early last week. Still trying to perfect the whole process. It looks a lot easier than it really is. I love your blog Jen and I'm happy that you are feeling better. It felt like you were gone forever. Looks like I'm done ordering then. Oh well, nice while it lasted. I wonder why they don't announce it on their website? Oh man, thanks for letting us know! I just placed an order... my March no-buy is starting off quite badly LOL. But I've always wanted to get some Konad stuff, so I couldn't pass this up! When I saw the Konad I should have just kept scrolling down my RSS reader LMAO!! I just spent so much money today on vidoe games and now...I've spent more than I should on my nails, but the bills are all paid for the month, that's all that matters right?! LOL thanks for the code!! Oh no!Must stalk up! Oh and for gradients, there's really no need for a kit. All you need are three monochromatic colors and a triangle makeup sponge. From the tip, layer lightest to darkest and start dabbing. It's major messy, but way fun! I just received my konad order today! This is my first time using this product and I am having some difficulty. The problem I am having is that the special nail polish will not transfer from the plate to the stamp. I'm applying the special nail polish to the image plate and scraping off the excess with the scraper, but then I can't get the nail polish onto the stamp. I'm doing it as fast as I can, but the image won't stick. Can you help me? What am I doing wrong? I checked out your other post which mentioned that you had to peel the plastic off the image plate first. I tried to do that, but I can't find any plastic on mine. This is so frustrating.. I want to start using this so badly... haha! Oh, some other blogs said that you had to file the stamp to make it rough so that the polish will stick. Is that true? I'm afraid to do that. I don't want to damage the stamp. Please help me! Thanks! Anonymous: You only have to peel off the plastic on fauxnad plates. 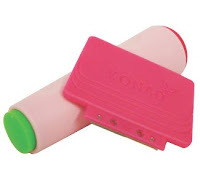 The Konad brand ones come ready to use. Some people like to sand down the stamper tool (reddish rubber part) to make it pick up the design easier but I never did that. Are you cleaning off the plate and stamper really well with polish remover before you use it? Also, try different pressures when you use the stamper on the plate. If you still have problems, send me an e-mail at frmheadtotoe@gmail.com and we can troubleshoot some more! Oh my. I WANT I WANT I WANT! Unfortunately I don't have access to any form of online shopping though. One day I'll be conquering you online shops! I just jumped on the nail stamp bandwagon thanks to your posts, your nails are always super cute! Rock & Republic Beauty on Hautelook!